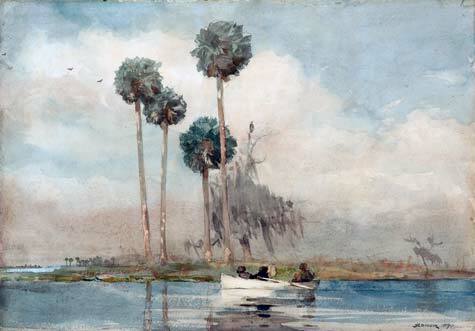 Florida’s lush natural beauty appealed to Winslow Homer as both an artist and outdoorsman. He made seven trips to the state, and in 1890 traveled the St. Johns River to fish. During that visit, he was inspired to capture this tranquil scene. Although Florida’s dense, exotic landscape would have appeared ominous to some, Homer portrayed a peaceful moment where man and nature coexist in harmony, even while nature’s supremacy is asserted through the imposing height of the palm trees.